Please do not use this site on Shabbos or Yom Tov. 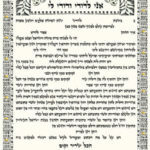 TINAK: This is not a Ketubah, Yes it is! We steal a glimpse of two deer resting in the shade of trees in the quiet of the afternoon. 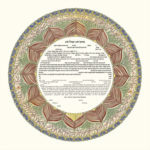 The pervasive tranquility in the Orchard Ketubah alludes to the marriage union as a restorative and strengthening bond. We may leave the tumult of our lives behind and re-enter the orchard to seek companionship, a quiet moment and repose. This delicate paper cut ketubah is highlighted with gold detail and comes in an elegantly bound folder. Two birds playfully flank a bridal canopy comprised of myrtle leaves in the Songbird Ketubah. Under the chupah is a golden menorah symbolizing the light of the Torah and its great wisdom. The naïve style of the paper cut and the lively palette add to the delightful mood evoked by this ketubah which celebrates the joy of the marriage union. This paper cut ketubah is highlighted with hand applied 24 karat good leaf and comes in an elegantly bound folder. The Stars in the Sky Ketubah is inspired by God's promise to the Jewish people, to make them “as numerous as the stars in the sky, and as the sand on the seashore”. The expanse of the sky and blend of etherial colors makes for a work of art that truly stands out. 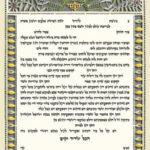 A magnificent Ketubah that speaks of a couple's connection to God, tradition and each other. 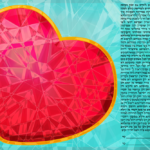 The Diamond Heart Ketubah features a large red heart and blue background with the Ketubah text off to the side. 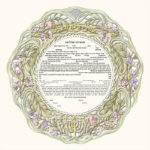 This Ketubah contains beautiful elements of tradition and romance. 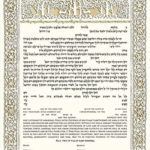 This work of art is perfect for the couple that i searching for a top-quality Ketubah with traditional elements. The quiet palette of mint green and the simplicity in the design of the paper cut, make the Gold Leaves Ketubah an eloquent choice. A delicate ornamental border surrounding the text lends distinct elegance while the myrtle leaves, suggestive of the bridal canopy, culminate in a central starburst motif. Below is written the words: Ani li’dodi vi’dodi li : I am my Beloved’s and my Beloved is mine” from Song of Songs 6:3. The art work is enhanced with 24 karat gold leaf and comes in a lovely bound folder. Limited edition. 1,000 Paper cranes granting you a wish is an enduring symbol from ancient Japanese legends — but a symbol that is still powerful today for a wedding: the passionate focus and attention you need to create 1,000 paper cranes is the same focus and attention you need to put towards your marriage to make it work — granting the wish of happiness for the couple! This ketubah is perfect for the couple who values not only simplicity and minimalism, but who are always flying to the next destination. The dangling paper cranes represent the enduring love and peace that will stay constant with the couple, as time moves on. Two trees stand in close proximity of one another. Their branches and leaves intertwine and become as one. Embedded within the foliage are King David's words from Song of Songs 6:3 – in Hebrew and in English- I am my Beloved's and my Beloved is mine. אני לדודי ודודי לי A beautiful paper cut with its clear and simple declaration of a long-lasting and nurturing love. · Giclee litho, paper cut, 24 karat genuine gold leaf. · A limited edition; all ketubahs are numbered and signed by the artist. 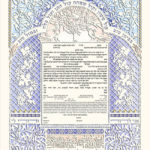 Symbolic motifs abound in the Karmei Yerushalayim (Jerusalem Vineyards) ketubah. Two peacocks (beauty) flanking a pomegranate tree (plenty) are bathed in golden light. The clusters of grapes surrounding the text remind us of the wine, which plays a central part of the wedding ceremony. Wine is symbolic of the life cycle. Just as the grape juice is transformed to something that improves with age, so may the marriage bring increasing joy throughout the years. Beneath the text is the city of Jerusalem, always cherished in our hearts and minds. 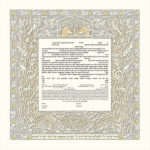 The Karmei Yerushalayim paper-cut ketubah is a double-layered giclee print, hand-embellished with 24-karat gold. 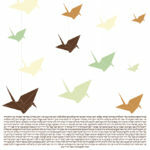 The Hadas (Myrtle Leaves) Ketubah, in its simplicity of design, is an elegant and sophisticated artwork. The myrtle leaf — a symbol of love and marriage — spirals outward and continuously encircles the ketubah text. With each circle the myrtle leaves grow larger and stronger, symbolic of the expansive nature of the bride and groom's ever-deepening love. 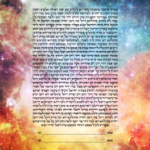 Clarity of form and color, combined with succinct visual imagery render a ketubah of grace and refinement. The Hadas is a giclee print and paper cut, embellished with hand applied 24-karat gold leaf. 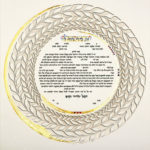 The Circle of Life Ketubah With its vivacious paper cut design, the Circle of Life ketubah brims with organic movement. Fragile blue petals, encircling the text, join together to create a stylized flower, while delicate bushes extend outward in a burst of growth. These intertwining elements remind us of the intertwining lives of the bride and groom. An outer band of decorative motifs, enhanced with 24- karat gold leaf, enclose the composition and give the ketubah a doily-like effect. The Circle of Life is a fanciful interpretation of the rhythmic flow of life's diverse elements that move with continual change only to flow together into an overall and unified pattern. Intertwining spring flowers and olive leaves adorn this elegant papercut ketubah. The pastel green and lilac, and pale pinks remind us of a yearning for a past era. Olive branches extend in a rhythmic flow and evoke an image of nature's awakening in the early spring. Ornamental braids of growth and blossoming encircle the text. 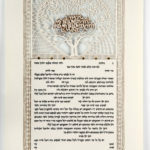 The words from Song of Songs: Ani l'dodi vi dodi li –I am my beloved's and my beloved is mine, embellished with 24 karat gold leaf is woven into the paper cut and crowns the artwork The Aviv ketubah is a visual analogy of love, nurturing and growth. A rhythmic growth of vines,reaching upwards towards the skies dominates the eloquent design of the Jerusalem Gate ketubah. Here is Spring’s awakening: a dance of leaves and tendrils creating patterns of loveliness and vitality. Set in the midst of this lively activity is a vignette of two deer quietly grazing beside the gates of Jerusalem. There reigns an air of tranquility: a stolen moment of repose in life’s exhilarating journey. This is an eloquent allegory for the bride and groom and the oaths exchanged, which both binds and strengthens each one. These words from Hosea 2:21 embody the deep commitment of the marriage covenant. This giclee printed paper cut ketubah is hand embellished with 24 karat gold leaf. Limited edition: numbered and signed by the artist. Orthodox Ketubot is the only site of its kind to allow you to buy strict Orthodox Ketubot with Orthodox texts.